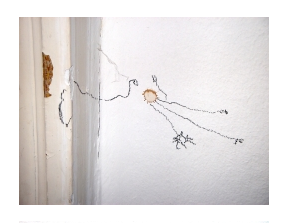 Drawing Space is an interesting initiative by Brighton artist Carolyn Bew during the Artist Open House. It is a collaborative event over three weekends. Visitors are invited to take part in a collective drawing incorporating sound and video, which will transform this empty space into an interactive environment. Each evening a video will be made of the artworks, before the walls are repainted for the following day.